Gaining just a few extra pounds can cause big health problems for your pet. Although chubby pets may look cute, extra weight increases the risk that your pet will develop several preventable diseases and health conditions, including diabetes, arthritis and liver disease. How Does Extra Weight Affect My Pet? Obesity affects pets in many of the same ways it affects people. Weight gain increases pressure on the joints, which can lead to osteoarthritis and tears in the anterior cruciate ligament. If your dog already has hip dysplasia, piling on the pounds can worsen the problem. Overweight pets may quickly become tired when exercising and may become overheated more easily. Extra weight can increase your pets' chances of developing heart failure, high blood pressure, liver or kidney disease, spinal disc problems and other conditions. Rising pet obesity rates mean that a significant percentage of pets now face these serious health issues. The Association for Pet Obesity Prevention estimates 54 percent of dogs and 59 percent of cats are obese or overweight. How Common is Diabetes in Pets? Diabetes is the third most common obesity-related condition in cats and the sixth most common in dogs, according to a 2015 Nationwide Insurance review of pet insurance claims. Although the disease can affect pets of any age, it's more common in older animals. How Does Diabetes Affect Pets? Every time your pet eats, carbohydrates and sugars in foods are converted into glucose. Glucose, a natural blood sugar, circulates through the bloodstream to provide energy to every part of your pet's body. The hormone insulin regulates how much glucose enters the bloodstream. If the pancreas doesn't produce enough insulin or your pet's body can't use it properly, his or her blood sugar level will begin to increase, causing diabetes symptoms. How is Diabetes Treated in Pets? In some cases, your pet can overcome diabetes with weight loss and a diet change. If weight loss doesn't help, or if the diabetes isn't caused by obesity, your pet may need to take oral medications or receive insulin injections every day. Your pet's veterinarian may also recommend switching to a food formulated specifically for diabetic dogs or cats. You'll need to carefully monitor your pet's food and water intake and return to the veterinarian's office periodically for follow up visits and blood and urine tests. How Can I Help My Pet Avoid Diabetes? Don't Make Overeating Easy. Your pet's veterinarian will let you how much food your dog or cat should eat every day to lose weight. If you're used to dumping a handful of food in your pet's dish and leaving it out all day, the recommended amounts may seem small at first. Unfortunately, if you give into those pleading looks from your pet, weight loss will be much more difficult. Count Calories. It's important to count every morsel of food that your pet eats during the day, including treats and table scraps. Even if your pet only eats the new food, weight gain may occur if multiple family members can't resist giving your furry friend treats. Post a food list on the refrigerator and ask every family member to note what they fed your pet to avoid overfeeding. Increase Exercise. Exercise offers a simple and fun way for your pet to lose weight. Depending on your pet's age and size, you may want to schedule long walks or runs or play more games of fetch. Anything you can do to encourage your pet to move more will have a beneficial effect on his or her health. Visit the Vet Regularly. Your pet's veterinarian may be able to spot the signs and symptoms of diabetes before you do. Annual veterinary visits are crucial and help ensure that diabetes and other illnesses and conditions are promptly diagnosed and treated. 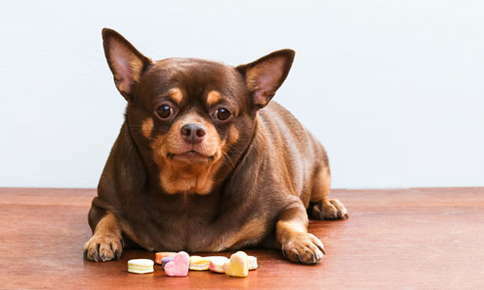 Are you worried that your pet may be overweight or at higher risk for diabetes? Call us today to schedule an appointment.